There are an estimated 30 million slaves in the world today. Let that sink in. That’s more slaves than during the entire trans-Atlantic slave trade—more than any other time in history. Thankfully, there are also many organizations dedicated to abolishing the modern slave trade, like Not For Sale, based in San Francisco. They work “to identify the root causes of slavery in vulnerable communities and address those causes with solutions that prevent slavery and create new futures for survivors,” says Jill Morris of Not For Sale. This year Not For Sale began partnering with musicians to raise funds, awareness and action around the issue of human trafficking and modern-day slavery through co-branded T-shirt sales. “It’s a platform that ties a common experience for everyone—music—with a cause that is fighting a major problem in our world,” Morris explains. Proceeds from the BRMC Free2Rock campaign will help Not For Sale create programs that encourage economic development and provide job skills training for vulnerable communities around the world. In addition, the limited-edition shirts are ethically produced at Not For Sale’s partner factory in El Salvador which employs human-trafficking survivors and individuals at risk of exploitation. 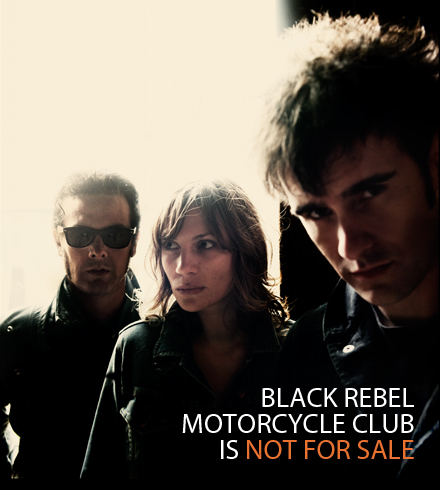 “BRMC has been a supporter of Not For Sale through the years and their song, Conscious Killer, was recently featured in a Miller Lite commercial with all of the royalties going to Not For Sale. It only makes sense that we join forces on such a good cause,” Morris says. To support Free2Rock and get your very own t-shirt visit www.notforsalestore.org. Merch Store back online !